Crime Statistics | Gainesville FL Realtors & Property Managers. EXIT Realty Producers. Contact the local law enforcement agencies. Drive by the neighborhood in the evening time. Typically more home-owners are home at this time of day so it will afford you the opportunity to get a feel for the area and better understand the community as a whole. 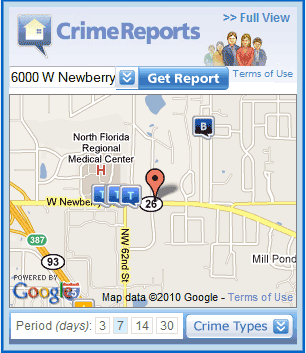 You can search the CrimeReports website for crime reporting information. From this website you will be able to view criminal activity in a mapped format reported from both local law enforcement agencies.